Big news: the Point Neighborhood Association (PNA) finally gets a permanent space! The new residential development at 135 Lafayette Street includes a large community room. Happily this space is in the neighborhood, and there is talk of this being the future site of voting too. – Salem police does not enforce the federal immigration policy, and so no victim of a crime should fear reporting an injustice or crime due to their immigration status. – The Chief is “not opposed” to the Safe Driver’s Bill, which Mayor Kim Driscoll supports, as long as measures are taken to prevent the its use in any illegal capacity. – Unlicensed drivers that are stopped and unknown to the officer may be arrested if the officer uses discretion as to whether that person would not show up to a later summoned court date; if one is arrested, the fingerprints are automatically sent to the federal government and can result in deportation. While the federal government assures that it is interested in only deporting criminal offenders, one of the PNA meeting members cited a statistic that in Essex County 75% of those deported are first time offenders. – Communication and trust reinforce each other, and so, the Chief will work to have a bilingual officer on every shift. Additionally, for every certain number of officers in Salem, a certain percentage will be Latino. Currently, there are 12 bilingual officers, and 4 caucasian officers fluent in Spanish. – In addition, officers will be encouraged to attend workshops for sensitivity training having to do with specific communities with which they are unfamiliar. He cited the ultimately positive effect of sensitivity classes on the relationship between a police department with a Somali neighborhood in South Portland after an initial tragic shooting of one of the residents. The second part of the meeting featured the beginning preliminary design and efforts of engagement with residents for the Ward Street lot that will be a pocket community open space. The North Shore CDC purchased the lot, and secured a couple grants to develop the space. The grants stipulate that the lot remains open space and that at least three community engagement meetings are held. This is a great effort and a great beginning for a small space in an area that has so little open public space. So far, one meeting was held for the adjacent residents, and only one resident went. The NSCDC then targeted houses with door knocking and flyers. The response has been minimal and understandably frustrating. 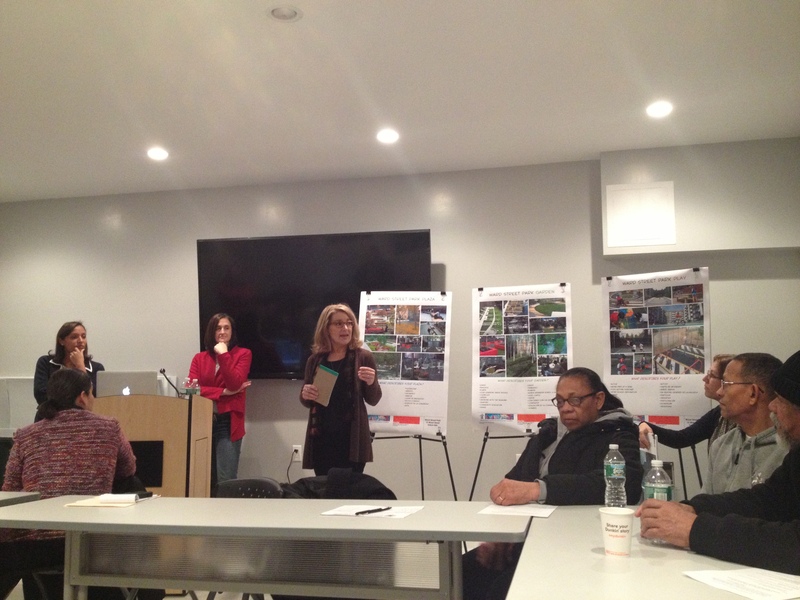 Last night marked the final meeting for resident engagement for Ward Street Lot before design begins. In order to determine the nature of the final space, Naomi Cottrell of Michelle Crowley Landscape Architecture proposed the themes of play, plaza, or garden as potential main uses for the space. There was ultimately a spirited discussion among the almost twenty residents, although only two seemed to be from the immediate neighborhood of Ward Street. – A basketball court, even a small one or a half court was first put forth as the ideal main use; this initially generated a great deal of support. – The second suggestion. which seemed to come from one of the close by residents, was a space for adults to sit and relax and enjoy time outside, since children do have options in the neighborhood. There was general consensus, however, bemoaning the shortcomings of Peabody Street park close to the site in question. I would add: a cautionary tale of what happens when residents are not truly involved in the process – and involvement is much more than voicing an opinion at a meeting… but more on this later. – Another resident living close to the future Ward Street pocket space was a young mother who noted that she has to walk at least “two blocks in any direction from [her] house to see some trees and greenery.” She wanted a green garden park space. Ultimately, although small, and in need of remediation, and equipped with a small budget, this space has the opportunity to provide nature, play, and beauty to one of the densest and least green areas in Salem. These are not insurmountable obstacles, especially when good will and creativity are close at hand. What is truly unfortunate is the proposed timeline: the NSCDC wants construction to begin in the spring, as soon as the rehabilitation of the decrepit retaining wall is completed. Since the existing retaining wall on site needs to be retrofitted as soon as possible, it makes short-term financial sense to begin construction on the final design of the open space as soon as the wall is finished since all the aspects of construction will already be underway. It does cost more money to stop construction and take time to truly involve the community on site, but it is absolutely worth it. Construction should only begin on something the community not only wants, but will also use and maintain, not be cause they just happen to like it, but because they have ownership of it. I, of course, speak from the experience I had last fall in building the fifty foot long suggestion wall at the Palmer Street lot. As we built the project, residents warned me that it would get tagged or simply destroyed. None of this happened because we built the wall with the community – and not only that, but the community gave us over 90 responses to the simple prompt of what they thought the lot could be. Compare this to the minimal engagement currently reported on the Ward Street pocket space. While I have no doubt that efforts have been thorough and genuine, meaningful participation is hard to come by and it rarely results from a survey. Even a door knock can be intrusive: how many times has someone asked you on the spot: “what is your favorite book, movie, restaurant?” These tactics are not futile, but they gain traction if supported by real on the ground dynamic participation: get out of the community rooms, and put up your requests for engagement at the site in question. There people can walk by, muse, think about it, and on their own time, of their own volition, take action to tell what they know. Community meetings are indispensable, but when people work and are in the midst of their life, a quiet solicitation is kinder and more effective. This entry was posted in Participate, PNA Meetings and tagged chief tucker, community meetings, michelle crowley landscape architecture, NSCDC, participation, salem police, ward st by jellybeancity. Bookmark the permalink. I am originally from Cape Ann, MA, and the Point neighborhood has held a very warm space in my heart since it was introduced to me by a friend and coworker who resided on Ward Street 30 years ago. I am so sad that I can’t participate in all these wonderful Point activities and plans b/c I live in St. Paul, MN. I did, however, create a Board on Pinterest.com entitled: Salem Point, I Adore Thee with lots of photos that bring back so many excellent memories of my spending time in the Point neighborhoods. Keep the Vision alive!!!! !